"With the Lord a day is like a thousand years, and a thousand years is like a day." I think of this verse as I try to remember where the year went. I hear it often said that "the older I get the faster time goes." Any more I feel the same way. It seems like 2018 just got under way a couple weeks ago, but as I write this there are only a couple weeks left. It is also often said that "time flies when you are having fun." If this is true, it has been a good year filled with fun. In addition, it has been a year filled with challenges and disappointments, but also a year filled with many blessings. The Lord continues to give Kingdom Boundaries the opportunity to witness to men prior to their release from prison and after they are released. With the addition of Pastor Mark, we were able to offer two additional Bible studies during the week to work around different work and treatment schedules of the residents. This allows more one on one time with the men. Kingdom Boundaries has been blessed by those that support this ministry. We have continued to receive clothing donations that keeps Rhonda busy in "Rhonda Mart." We have added a car program that helps men purchase a car when they have little or no credit. Through this program we were able to supply 6 men with vehicles. We have also been able to substantially reduce our debt. Because of this, we were able to purchase the house adjacent to ''The Master's House'' when it came available this fall. With the addition of "The Holy Spirit's Inn'', we can offer addition housing to men and lengthen their time that they can stay involved with Kingdom Boundaries. Kingdom Boundaries has been also contemplating a program for women. There is an existing women's program with a house that has come up for sale. We are currently looking into the feasibility of expanding in this direction. This would though require more staff and additional debt. Like I said, it has been a great year and I would like to say a big thank you to all that have supported Kingdom Boundaries during this past year with your prayers, words of encouragement, and with your financial support. Please continue to pray for the men, board, and staff of Kingdom Boundaries. Lastly, please consider a year end financial gift, and/or continued financial support for the coming year. These are essential as we move forward in 2019 as we minister to those that God has not forgotten. Please join us in this ministry. Father, we praise You for the great things You've done in our lives this year. We rejoice in Your mercy and care for us. It would be great if you could help Kingdom Boundaries Prison Aftercare with a gift on "Giving Tuesday". Your gift will be used to pay down the loan on the house we recently purchased, This house will provide additional space for more Kingdom Boundary residents. Your help would be greatly appreciated. Thank you for thinking and praying about this opportunity! We will send another email on November 26th with how to make your donations. I would like to take this time to convey a great big thank you to all that attended our 4th annual banquet last evening! In a world that is so quick to judge and condemn the actions of others, it was refreshing and exciting to spend the evening with those who are willing to forgive and come along side those the world considers "the least of these". Just by coming to the banquet, you showed support for the staff, board, and the men that have, are, and will reside at KBPA. We enjoyed a fine dinner (provided by the board), heard testimonies from a few of the men, and were updated on the events of the last year. 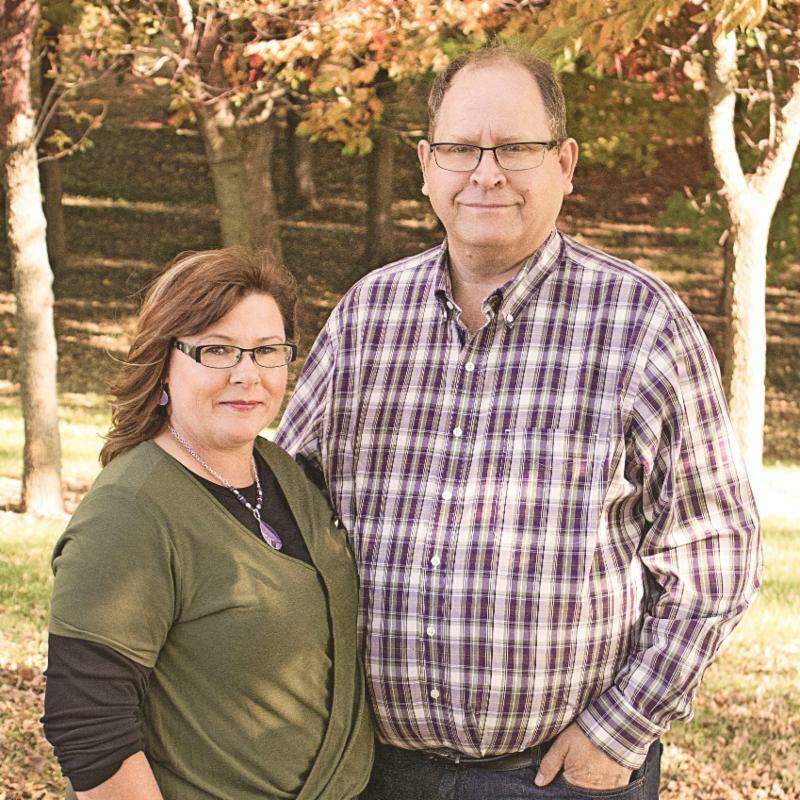 It was an exciting year as we were able to add Pastor Mark Van Der Brink to our staff, continue to improve the property, pay off a portion of our debt, and were able to purchase the house adjacent to "The Master's House". Again, I would like to say thank you on behalf of the board, staff, and residents. Your attendance made last night a great evening. For those that were in attendance and those that were not able to attend, it is with your prayers, encouragement and financial support that gives KBPA the ability to continue to walk alongside those very special to our Father. It has not gone unnoticed. 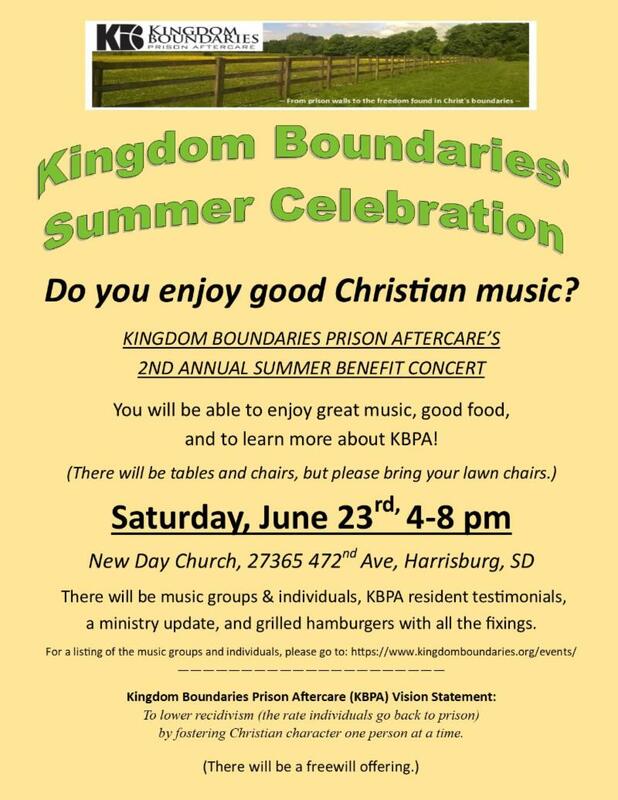 Come learn about Kingdom Boundaries Prison Aftercare ministries, get updates on what has happened during the last year, and find out what's being looked into for the future! Compassion is understanding the troubles of others and reaching out. Matthew 18:12 "If a man has a hundred sheep and one of them wanders away, what will he do? Won't he leave the ninety-nine others on the hills and go out to search for the one that is lost?" Have you ever had a time in your life when nothing seemed to go right? There is no joy because it seems everything you do doesn't work or those you have invested time in don't turn out the way you expected them to? The last part of June and the beginning of July were just that for me. There were men at KBPA that were struggling in their addictions to point of using again. Another man was detained for failing a polygraph that from everybody's point of view was doing extremely well. I heard of others that had lived at KBPA that were again using. Men that I thought were well on their way. They had good jobs, good environments, and they were men that seemed motivated to stay clean, but hadn't. The disappointment was starting to take its toll and I began wondering if all the effort was worth it? I talked to others in ministry that have experienced the same thing. Not that this made me happy, but the fact others in ministry had experienced the same disappointments reassures me that disappointment is part of ministry. I had a pastor friend of mine tell me once: "This job would be a lot easier if I didn't have to deal with people." He was joking of course, but there is a twinge of truth in that statement. The men at KBPA also realized that I was struggling with this. Maybe it was because I was a little, okay, a lot less patient with them. This is when one of the men called me and encouraged to me "remember the one." He said, and he is right, "that if what KBPA does only makes a difference for one man, it will all be worth it." The truth of the matter is that it does make a difference, and for more than one. This is what I need to remember. I would like to tell you of one such man. His name is Richard. Rich was released last December in the hardest month of the year to find a job. But this didn't stop him from gaining employment. He got a job working at the Event Center setting up and tearing down for different events. He would get up early to get to work and sometimes work all night shoveling snow. Because of legal reasons he was never was able to get his driver's license, but between his feet, a bike, and rides from others, he would always make it to work. Things didn't always go so smooth between Rich and me. There were things that he didn't want to do in the beginning that he had agreed to do when he applied to be a part of KBPA. But as we continued to communicate, and we worked through these issues. Rich is a welder and was turned down for a couple welding jobs because of his past. Rick didn't give up and found a welding job that he enjoyed and that paid him well. While living at KBPA Rich attended bible studies and church, stayed sober and clean, and rekindled his relationship with his wife. At the end of August Rich flatted his number and was able to move back in with his wife. He left KBPA in good standing and with money in his pocket. I need to remember "the ones" that do well. Please to continue praying for the men, board and staff of KBPA. Thank you for your prayers and support. The Kingdom Boundaries Prison Aftercare (KBPA) vision statement goal is to lower the return rate of inmates to prison, also known as the "recidivism" rate. We believe this is accomplished by encouraging Christian character one person at a time to the men following the KBPA program. Our KBPA program offers re-entry assistance for men being released from prison. Part of the assistance KBPA staff gives is three weekly bible studies at our facility. (The current residents must attend at least one of the weekly bible studies.) The bible studies are led by either a staff member or one of the current residents. We have both evening and morning bible studies to accommodate the schedules of each resident. On Monday night, the bible study is "The Gospel of John" by Tony Evans. In this study of Gospel of John, Dr. Tony Evans encourages us to turn to Christ by reminding us of the two purposes for the beloved disciples. First, there is only one hope that is truly trustworthy, and secondly that our hope is through our Savior, Jesus Christ. Every Tuesday morning is the study of Joshua. The book of Joshua is the story of God making good on his promises. It tells how Israel entered and conquered the land God had promised them. When studying this book, we learn that God's faithfulness is so complete we hear this proclamation: "You will know that with all your heart and soul that not one of all the good promises the LORD your God gave you has failed. Every promise has been fulfilled; not one has failed." (Josh. 23:14) Joshua is book for those whose prayers seem to go unanswered and for those who wonder if God is really alive and active. It is also for those who desire the fresh assurance of God's dependability. The "Mountain Movers" workbook is the third bible study offered at KBPA. The "Mountain Movers" workbook is based on Matthew 17:20, wherein Jesus addresses personal faith and its comparison to a mustard seed. The mustard is so every small, just like our faith when we receive Jesus Christ as our Savior. Faith is a growing process. It is through the "Mountain Movers" workbook that our faith will grow to fulfill God's purpose and plan in each our lives. The Bible is the Word of God as our source of authority for all studies. The Scriptures set the foundation for each of the bible studies at Kingdom Boundaries. The Bible says, "All Scripture is God-breathed and is useful for teaching, rebuking, correcting and training in righteousness, so that the servant of God may be thoroughly equipped for every good work" 2 Timothy 3:16. I would like to thank the local Gideons International for their donation of bibles to Kingdom Boundaries. These bibles are available for any person that comes through the doors at Kingdom Boundaries Prison Aftercare. God is always ready to forgive and restore. My name is Mike Morse. I was in prison for 15 years. The nourishment that I needed to be able to survive the 15 years only came by the grace of God's Word. Now I am a resident at Kingdom Boundaries Prison Aftercare. One day at Kingdom Boundaries, I was talking to another resident that has a daughter in the women's prison in Pierre, SD. He was talking about how his daughter was struggling. She was attending a Bible Study, but did not have a Bible. I bought a Bible from the Crossroads Book Store and had it sent it to her. Since this, three other women have sent their testimonies to me and in return, I have sent them a Bible also. The Bibles that I send are either pink or purple NIV Bibles with their names on the covers. Right now, I have 4 other women that I would love to send a Bible to, but financially it is hard for me. Thus I'm asking anyone out there that has a heart for those that have fallen short, and who are hungry for God's Word to help financially. Would you consider a donation for the cost of these Bibles to be sent to these ladies that are in prison? The women are hungry for God's Word, so if you could donate to this, it would be greatly appreciated!! If you are willing to help Mike, please mark your donations accordingly! Thank you!! The gospel of truth shines through the brokenness of God's people. There are a tremendous number of different hats that are needed to be worn by the staff and board of KBPA. The most obvious is working with the men when they are released. (The men all have different personalities, various talents, and individual needs.) Other hats include working with the Department of Corrections (DOC), interviewing potential residents, finding housing for men that are getting ready to transition out of KBPA, and fundraising, to name a few. Fundraising is by far my least favorite activity. But a necessity to continue to be able to help men (and hopefully women in the future) transition from a life style that is neither God honoring or healthy. I would like to say on behalf of the board, residents, and staff of Kingdom Boundaries a sincere thank you to all of you that participated in one way or the other over the course of the last couple weeks at our fund raisers. It was awesome to meet with so many generous people in Platte, SD at the BBQ, in Rock Valley at the hymn sing, and near Harrisburg at the New Day Church concert celebration. All your support makes wearing this hat enjoyable. Give the LORD a chance to show you how good he is. Great blessings belong to those who depend on him! Faith relies on our Almighty God's unchanging character, not on our circumstances. Please RSVP Gloria at: 605-207-0096 or email dngkok@hotmail.com or click to register below. Please RSVP Mark at: 712-470-6662 or email mark.v@kingdomboundaries.org or click to register below. Please RSVP Gloria at: 605-207-0096 or email dngkok@hotmail.com. Please RSVP Mark at: 712-470-6662 or email mark.v@kingdomboundaries.org. God's Word is a valuable possession and a guide to life. Please RSVP Mark at: 712-470-6662 or email at: mark.v@kingdomboundaries.org to let us your favorite hymn and how many will be attending. 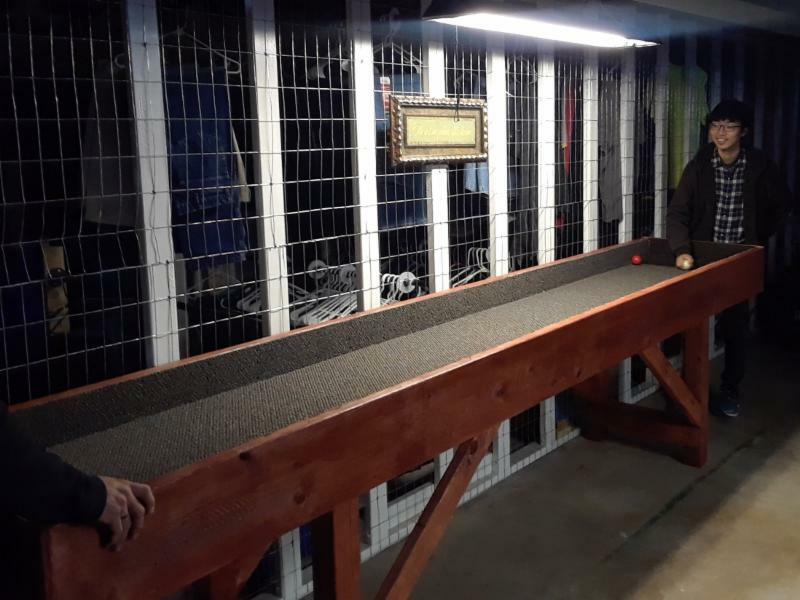 Kingdom Boundaries Prison Aftercare (KBPA) ministers to men leaving the prison walls and helping those men transition back into society, thus lowering recidivism. enjoy some sweet food and fellowship. If you forget to call or email, please come anyway. We will have room for everyone. More information will be coming out shortly on each of these events. We wanted to let you know now so you can mark your calendars for these informational and enjoyable activities. We look forward to seeing you! Since the beginning of Kingdom Boundaries Prison Aftercare, we have been blessed by a great group of board members. They have worked hard to establish KBPA, oversee its operations, decipher Gods will for expansion, and provide a constant supply of great support. We would like to take the time now to acknowledge several board members that have recently retired from the board and to let you know who continues to serve and well as welcome several new members. Those continuing to serve are Jeff Bass from Hills, MN, John Van Zanten from Rock Valley, IA, Pete Attema from Newcastle, NE, Val & Arch Brummel from Hull, IA, Marv Vos from Sioux Falls, SD, and Rick Castardo from Sioux Falls, SD. Our new board members are: Jason Hiemstra from Sioux Falls, SD, Verlyn Van Regenmorter from Sioux Center, IA, Dave & Gloria Kok from Platte, SD, and Jess Le Blount from Sioux Falls, SD. It is great to have you on board! God's counsel is trustworthy and wise. It is a Saturday morning and I am contemplating writing this article when I get two phone calls from men I have come to know in the last couple years. Both men have lived at "The Carpenter's Shop (TCS)", the housing portion of KBPA. Both men struggled at TCS and both were terminated for not adhering to or following the Covenant Agreement that they had agreed to and signed. Both men were eventually sent back to prison. They have since completed their sentences and have been released and have moved to different states. What I have observed in these two men, in others, and even in myself, is the desire for a Savior, but not a Lord. Jesus is a Lord and Savior, and we call Him that, but do we really understand the meaning of these two terms as it relates to Jesus? Savior: "A person who helps people achieve salvation or saves them from something." When we find ourselves in a spot where we can not fix it ourselves we will accept help from others. We want to be saved and this is good because without a sense of hopelessness, we would never seek God (Jesus). But how many want a Lord? Lord: "A person who has authority, control, or power over others, a master, chief, or ruler." In both these men, they are reaching out because they wanted help. But in each, I also see that they want control they just can't quite surrender. Are we all like this to some degree? I know I am. To have a Lord means I need to take the position as a slave and to be obedient. Jesus said, "If you love me keep my commandments." We need to be obedient to all His commandments, not just the ones that are convenient. We love Jesus because He first loved us. He lived, died, and rose again so He could be our Savior and have salvation through Him. Do I, do we, respond by obeying Jesus as our Lord? Jesus Is Lord because He has all authority. Matthew 28:18 "Jesus came and told his disciples, "I have been given all authority in heaven and on earth. Therefore, go"
There are many obstacles that individuals face upon release from prison. Life in prison may be a lot of things, but one thing it is not, is fast paced. But that changes quickly once they are "outside the wire". Back in society, life suddenly gets very fast. There are parole meetings, treatment, and aftercare meetings to attend. Along with these things there is the need to get to the grocery store, job interviews, doctor apartments, jobs, church activities, and various other responsibilities. Getting to all these events can be a little overwhelming, especially when your transportation is by foot, bike, bus, or depending on others. Personal reliable transportation greatly decreases stress and allows individuals a chance for a better job and a quality of life that greatly reduces their desire to go back to old habits. No credit, bad credit, low income, and the availability of value priced reliable vehicles add to the obstacles that keep individuals from becoming more independent productive citizens. Transportation: providing vehicles that are affordable, below fair market value. Credit: One American Bank is willing to make car loans to individuals with no or low credit at a very reasonable interest rate. Financial blessing: an income source for KBPA. Many times, we find that individuals would rather give material gifts verses monetary gifts. Thank you for considering giving a material gift that is also a financial blessing. "Felon Friendly" is a term that we often use to describe people or places. When those previously incarcerated are looking for a place to live, KBPA has a list of "felon friendly" landlords. These are those that are willing to rent to previously incarcerated individuals. It is the same when looking for a job. Are employers "felon friendly"? Unfortunately we even must ask this question when looking for a church for our residents to attend. Not all churches are "felon friendly." I am happy to report that there are many, and I would say most churches are welcoming to these individuals. But there have been a few instances when KBPA residents were asked not to come back. Felon, by definition "is a person that has been convicted of a felony." Or in other words, someone who has committed and has been found guilty of breaking the law. Isn't it awesome that we have a "felon friendly" God!! Rom. 5:8 But God demonstrates his own love for us in this: While we were still sinners (felons), Christ died for us. Thankfully, because of Jesus Christ's sacrifice, all can receive a pardon and have our 'felony' convictions removed. Please continue to pray for the board, staff, volunteers, and the individuals that the world calls felons. We need to remember that we are all loved by God, and redeemed by the blood of Jesus. When God forgives, our guilt is gone. Christmas is a special time of the year for many and hard for others, but for those incarcerated it can be especially difficult. In order to help bring a little Christmas joy for those incarcerated, Christmas sacks are given to each of the men. The sacks come filled with hard candy, peanuts, fudge, and a special treat, a Christmas card. These cards are handmade, usually by children, and are especially precious. When just about everything is taken from you, simple things become treasures. Thank you from the men to all who have made fudge, provided the funds to buy the peanuts and candy, to all who made cards and everyone who help organize, collect, and distribute the sacks of Christmas. In 2007 I was brought to prison (Sioux Falls) from Rapid City to do my 11.5 years. I did not know until Christmas came around that we got bags of fudge and peanuts, also with pieces of candy. The fudge was very good. Also in with the fudge was a home-made Christmas card. In 2007 I got my first one from Jasmine, and I have saved each one thereafter. I believe each year when Christmas came around I was more interested in the Christmas card than the fudge. Sometimes I would give my fudge away to guys as gifts. The cards touched my heart because a little child was making the cards for someone they did not know. They did it because they CARED to do it for someone that did not have a family to send them a Christmas card. I also believe it was something fun for they to do. Ronald Reaves Let others see your testimony as well as hear it. February 6th, 2018 Thank you for your condolences! We would like to take this time to thank everyone for your prayers and condolences these past weeks while our mom's health failed, and on her passing on January 17th, 2018. We were truly blessed to been born into a family with such a wonderful mom and mother-in-law. This is what she had written down for instructions for her service and I quote "death in the Lord is not a tragedy / death with the Lord is triumph and joy everlasting" and she added "Let the message be one of comfort - but more importantly one stressing the necessity and urgency of claiming and confessing Jesus Christ as the only way to have eternal life in Heaven." With mom's passing we grieve, but also celebrate that she has gone where she has desired to go. We are also reminded of the "urgency and necessity" of Matthew 28:19 "Therefore, go and make disciples of all the nations, baptizing them in the name of the Father and the Son and the Holy Spirit." "death in the Lord is not a tragedy / death with the Lord is triumph and joy everlasting"
On Christmas Day the residents and staff enjoyed a wonderful dinner together. 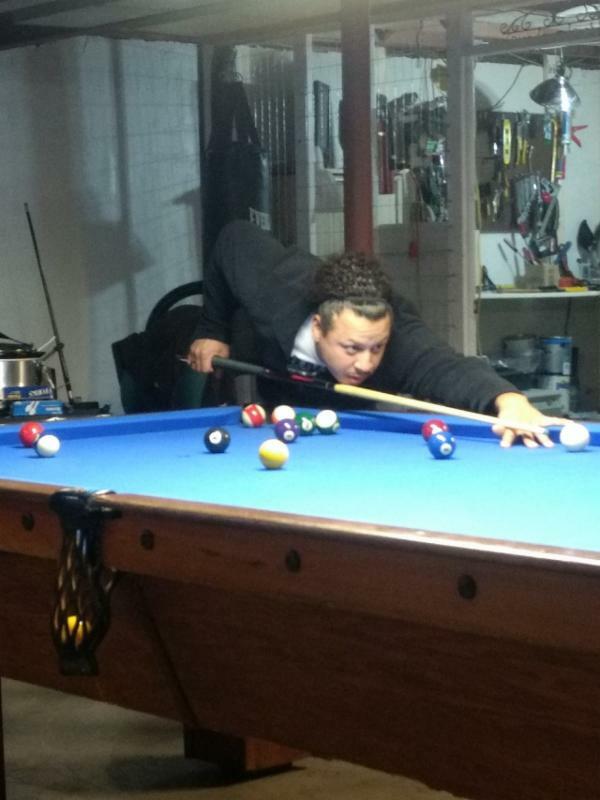 In the afternoon many men and staff members played some pool, carpet pool, and card games. Other men watched football in their apartments. All the men enjoyed receiving Christmas care packages from area churches and people. Some men were glad to celebrate Christmas on the outside of prison this year. Other men were depressed, since they couldn't celebrate Christmas with their families. The Christmas packages of cards and treats brought joy and happiness to all the men. 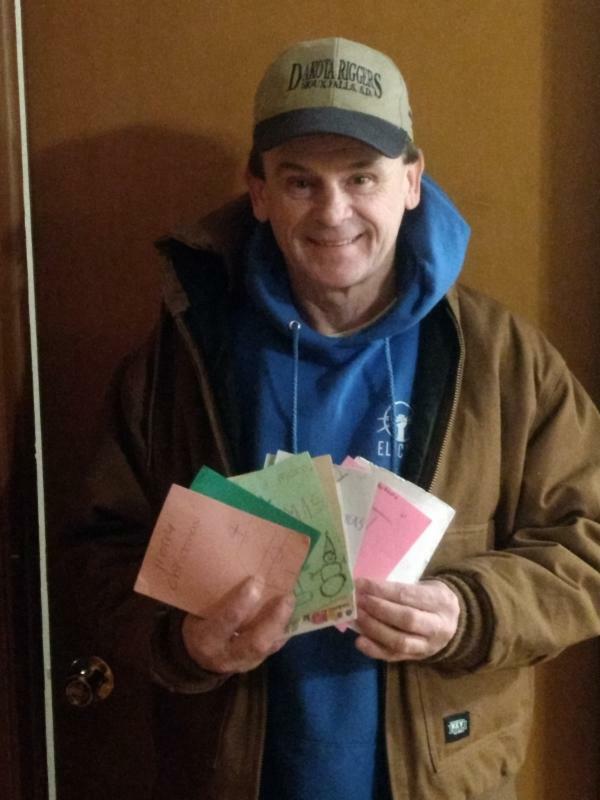 Some men were completely amazed to have received cards and treats from people around the community. I was reminded of Matthew 25:34-36 when Jesus is teaching about His coming again as the Son of Man to his disciples on the Mount of Olives. We look forward to that day when Jesus will return for the final judgement. But until his return Jesus is calling us to serve and love one another. We are called to serve others with faith, love and hope in Jesus Christ. It says in Matthew 25:40, "The King will reply, 'Truly I tell you, whatever you did for one of the least of these brothers and sisters of mine, you did for me." Kingdom Boundaries would like to say thanks for the donations of clothes, Christmas trees, decorations, Christmas treats and Christmas cards for the men at Kingdom Boundaries. We thank everyone for supporting the Kingdom Boundaries ministry in 2017. We ask that you may consider supporting the ministry of Kingdom Boundaries Prison Aftercare in 2018 as well. Please feel free to contact us for tour of the buildings and thanks for visiting our website. Hello, my name is Mark Van Der Brink. In December of 2017 I joined the staff at Kingdom Boundaries Prison Aftercare as chaplain. I am also a student at Sioux Falls Seminary. In May of this year, I will be graduating with a Master of Divinity degree. I am also seeking ordination as Minister of Word and Sacrament with the West Sioux Classis of Reformed Church of America. I am an active member at a speech club called Sodak Toastmasters in Sioux Falls. My wife is Lisa. We have been married for 30 years. We have two sons in Rock Valley, Iowa, and a daughter in Inwood, Iowa. We are also blessed with four grandchildren. In June of 2014 my wife and I moved from Rock Valley to Sioux Falls. We are members of the Doon Reformed Church in Doon, Iowa. We also attend worship services at the Good News Church in Sioux Falls, SD. In April 2012 I felt the Lord calling me into the ministry. I also felt that Lord was calling me to minister to the discipleship of men and to prison chaplaincy. In October 2017 the Lord revealed his mission for me. It was to minister to those in prison because of the high rate of recidivism for men and women in prison. I have listened to both female and male inmates tell about their struggles on the outside while on parole or after their completed sentence. As a chaplain for Kingdom Boundaries I am reminded of the words from 1 John 3:16-24. In verse 18 it says, "Dear Children, let us not love with words or tongue but with actions and in truth." You and I are called to show the love of God in words and action to those men at Kingdom Boundaries. The ministry at Kingdom Boundaries happens because of prayers, financial support, staff, and volunteers.